Wynne, M.J. 1981. Phaeophyta: Morphology and Classification. In: Lobban, C.S. & Wynne, M.J. 1981. 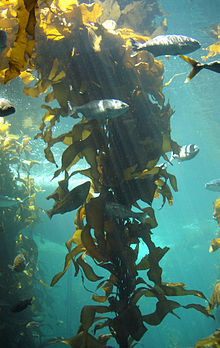 The Biology of seaweeds. Botanical Monographs 17. University of California Press. p. 52–85. Google Books. Reference page. Guiry, M.D. & Guiry, G.M. 2017. Phaeophyceae AlgaeBase. World-wide electronic publication, National University of Ireland, Galway. Accessed 21 April 2017. For more multimedia, look at Phaeophyceae on Wikimedia Commons. Kjellman, F.R. 1891–1893. Phaeophyceae (Fucoideae). p. 176–290. Dictyotales. p. 291–297 In:Engler, A. & Prantl, K. (eds. ), Die natürlichen Pflanzenfamilien, Teil 1, Abteilung 2. Leipzig: Wilhelm Engelmann: BHL Reference page. Chadefaud, M. (1960). Les végétaux non vasculaires (Cryptogamie). In: Traité de Botanique Systématique, eds. M. Chadefaud & L. Emberger. Tome I, Masson et Cie: Paris, . Scagel, R.F. (1966). The Phaeophyceae in perspective. Oceanography and Marine Biology, Annual Review 4: 123–194. Nakamura, Y. (1972). A proposal on the classification of the Phaeophyta. In: Contributions to the Systematics of Benthic Marine Algae of the North Pacific, ed. I. A. Abbott & M. Kurogi, pp. 147–56. Perestenko L. P. (1972). Ontogenesis of Phaeophyta and ontogenetic principle of constructing phylogenetic systems. Botan. Zhurnal, 57: 750–764. Wynne, M.J. & Loiseaux, S. (1976). Recent advances in life history studies of the Phaeophyta. Phycologia 15: 435–452. Clayton, M.N., 1990. 35. Phylum Phaeophyta. In: Margulis, L., J.O. Corliss, M. Melkonian, D.J. Chapman (ed.). Handbook of Protoctista. Jones and Bartlett Publishers, Boston, p. 698–714. See Brands, S.J. (1989–2015), . From Hoek, C. van den, Mann, D.G. and Jahns, H.M. (1995). Algae An Introduction to Phycology. Cambridge University Press, Cambridge.